Those evil pepper pots. the Daleks, are back in this four-part tale written by Terry Nation that aired from 23 February to 16 March, 1974. It’s always great to see this old foe return, but, it may be just me, I don’t think it is, but this feels like the weakest of all the Dalek stories that I’ve watched to date. The Doctor (Pertwee) and Sarah-Jane (Elisabeth Sladen) are planning a relaxing getaway to get some sun, when the TARDIS is dragged off course, and its energy drained by a power source on the planet Exxilon. In typical fashion, the pair get separated and encounter the strange race of humanoids populating the planet, and their reverence for a spectacular white city, that should anyone trespass they must be sacrificed. Sarah-Jane is the one who is to stumble upon the city first and consequently is lined up for a quick demise. The Doctor eluding the Exxilons , meets a human expedition from the Marine Space Corps. who have been marooned on the planet while attempting to collect a rare element, parrinium, to help combat a deadly plague. As they converse another ship lands, brought down by the power drain… the Daleks! Their weapons drained as well, they have almost no choice but to partner up with the humans to work together (until they can gain the upper hand) to find a way to restore power and get off the planet. 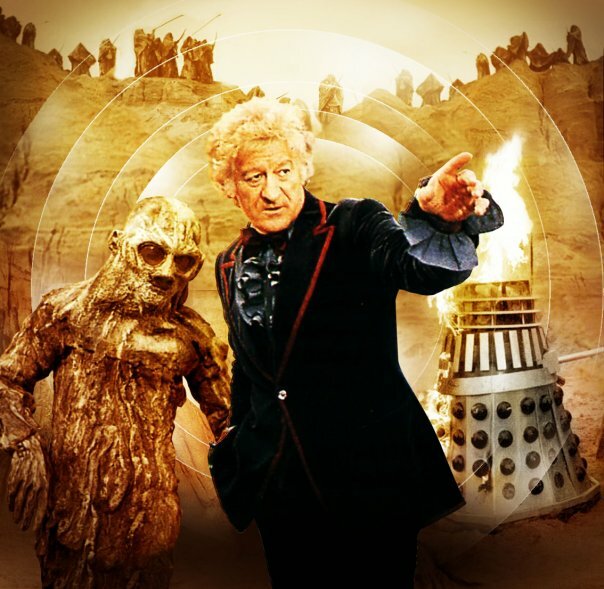 When the Doctor interferes in the would be sacrifice, he too is ejected into the subterranean tunnels while the Daleks (who have lied about their numbers) have reworked their lasers and are now armed with weapons that can deal out some serious damage, and are beginning to assume a measure of control over the situation. Amongst the tunnels the Doctor and Sarah-Jane encounter more Exillons, though these don’t share the same view as the surface dwellers, as well as some very dangerous roots to which, I assume, Doctor and Companion were meant to be sacrificed to. Instead the Doctor heads off with one of the aliens to investigate the white city, learning it is in face protected by a series of tests to measure intelligence so that only those who can understand it can enter it. Unfortunately, the newly armed Daleks are right on his tail. 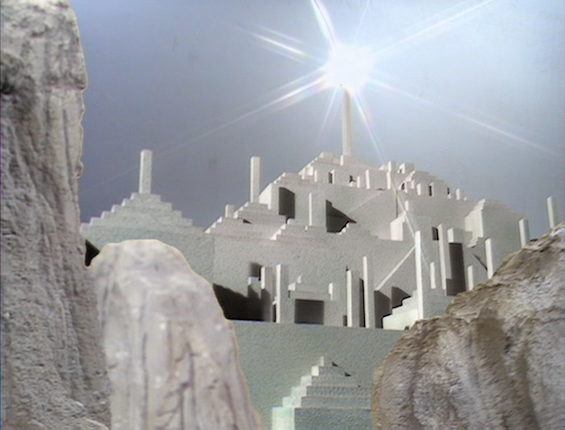 Stopping the interference restores power to the Daleks, as well as the TARDIS, and while the Daleks are making their escape with what they believe to be bags of parrinium (but are actually just bags of sand as organized by Sarah-Jane) one of the Space Corps. that had slipped aboard the craft destroy it and all the Daleks aboard before they could destroy our heroes! This is one of those missed opportunity stories I think… If the white city had played more prominently with more traps and tests, in fact had been the centerpiece of the story with the conflict with the Daleks tied more to that…. Next time the Doctor returns to Peladon and finds terror as he and Sarah-Jane encounter The Monster of Peladon! !